NEW YORK (CNNMoney) -- As the foreclosure crisis continues to wreak havoc on the housing market, a source of national pride has taken a sour turn. Home ownership is on the decline and, according to a recent Morgan Stanley report, the United States is fast becoming a nation of renters. Last Friday, the Census Bureau reported that the percentage of people who owned a home had dropped to 65.9% during the second quarter -- its lowest level since the first quarter of 1998 and a far cry from the high of 69.2% reached in late 2004. Yet, in a research paper issued a week earlier, Morgan Stanley (MS, Fortune 500) analysts Oliver Chang, Vishwanath Tirupattur and James Egan argued that the home ownership rate is even lower than the Census Bureau statistics say. In fact, once they factored in delinquent mortgage borrowers (the ones who are likely to lose their homes at some point), Morgan Stanley calculated that the home ownership rate is more like 59.2%. That's the lowest level since the Census Bureau started keeping quarterly records back in 1965 (before that, it recorded home ownership rates once a decade). The Census Bureau's statistics, however, do not factor in mortgage delinquencies. "The combination of falling home prices, limited mortgage credit, continued liquidations, and better rental options is fundamentally changing the way Americans live," the analysts said. "We believe this change is only beginning and is moving the country towards becoming a rentership society." Many people are still technically considered homeowners who occupy their homes, even though they no longer make their mortgage payments. These "homeowners" can squat for months or even years, because banks have been slow to process foreclosures in recent months. In addition to the millions of people who have lost their homes to foreclosure, Morgan Stanley said that another reason for the decline in home ownership is that many of the people who would like to buy homes can't get a mortgage. The private mortgage market has dried up and even the government-supported organizations, like Fannie Mae and Freddie Mac, have tightened their underwriting standards. "For the first time in recent history, the government is no longer promoting home ownership for all Americans, leading to a reconsideration of housing-related public policy," said the Morgan Stanley paper. In a February housing finance report, the Obama administration stated that its goal was to "ensure that Americans have access to an adequate range of affordable housing options. This does not mean our goal is for all Americans to be homeowners." Fannie and Freddie have already made it more expensive for riskier homebuyers to borrow and, starting Oct. 1, the mortgage giants will reduce the maximum amounts they will lend in high-cost areas. The government wants to encourage private capital to fill the gap but, currently, Fannie and Freddie, along with loans from the Federal Housing Authority, account for about 90% of all mortgage lending these days. Ken Johnson, a professor of real estate at Florida International University, who co-authored a recent paper with Eli Beracha of East Carolina University about how homebuying is now a better choice for most Americans, said he doubts that home ownership will fall much further below current levels. Johnson thinks the market has already hit bottom and home prices should start appreciating, albeit slowly, this year. In addition, with such favorable interest rates and good deals on homes, it's hard for potential buyers to resist taking advantage of the opportunity for too much longer. Prices have dipped 32% since they peaked in mid-2006 and interest rates on mortgages, if you can get one, are at or near historic lows. On Thursday, LendingTree reported that rates for a 30-year, fixed-rate loan reached a record low during the day: 4%. The dip in home ownership has done more than just line the pockets of landlords. It has also created a base of Americans with no home to rely on in times of financial need. Millions of owners can tap into their home's equity in times of financial stress or to pay for cars, college tuition or other major expenses. Paying for a home is also a type of "forced savings," said David Crowe, chief economist for the National Association of Home Builders. He explained that, after interest, mortgage payments go toward paying down the loan balance -- and for homeowners who end up in the right type of loan the ending balance can be significant. There are also less tangible benefits to home ownership. An increase in home ownership overall tends to improve community stability, according to "The Social Benefits of Homeownership and Stable Housing," a report released last year by the National Association of Realtors (NAR). In the paper, NAR cited several academic studies that found that children of homeowners have greater academic achievement than children of renters, that homeowners vote more and volunteer their participation in more community events than renters and that communities are better maintained and safer in neighborhoods with high ownership rates. On the other hand, there are a few benefits to renting. 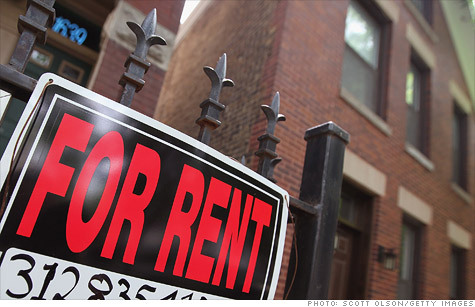 Renters are much more mobile: They can move to take a better job if the opportunity arises. And, more often than not, renting is cheaper than buying. If renters are disciplined about investing those savings, they can come out with more wealth than buyers. Plus, renters don't lose their shirts in housing busts. "Often maligned as a product on which you 'throw your money away,' rentals have become a much more valued housing option," said the Morgan Stanley authors.